Dual IR Lamps Dual 830nM wide angle IR Lamps that pan and tilt with the IR Dome give excellent nighttime pictures for up to 100 metres. Multi-protocols integration The Black Hawk IR Dome range comes with Multi Protocols as standard allowing complete integration with many leading DVR’s, Matrices and IP Systems. Protocols built-in include’TwistedPair’ control from 360 Vision, Honeywell, DM, Pelco P/D, Ultrak with ‘in-coax’ control from 360 Vision plus Pelco Coaxitron. 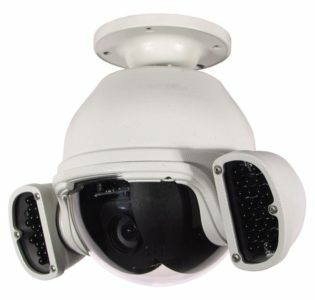 OSD Black Hawk IR Dome OSD enables full access to all functions using either 3rd party protocols 360 Vision control systems. Motor Motion Detection 360 Vision’s extensive VisionDome range, is driven by 360 Vision’s highly advanced motor control system, enabling extremely quiet, controllable and smooth with a totally accurate operation and exact preset position selection. Economics The Black Hawk IR Dome uses only the highest quality components for ultra reliability, combined with innovative design to support full remote diagnostics and reduce installation, operation and maintenance costs. Colour/Mono cameras The Black Hawk range includes 18x, 26x and 36x zoom with Autofocus featuring ExView camera technology which gives an excellent low light performance with frame integration for usable images as low as 0.01lux. 360 Vision software enables the colour/mono switch over levels to be set for specific lighting conditions. Fast shutter option For optimum performance with automatic number plate recognition systems.